Misinformation Has Contributed to the Severe Declines in Some Bighorn Sheep Populations. Wild Sheep Foundation speaks out. The Wild Sheep Foundation, for many years, has been raffling off a sheep hunting tag which often times generates more than $100,000 that is partially used to fund research conducted at the Caine Veterinary Teaching Center. According to an article in the Lewiston Morning Tribune (subscription only) they are questioning whether will continue to conduct the raffle thus impacting funding of the Center. 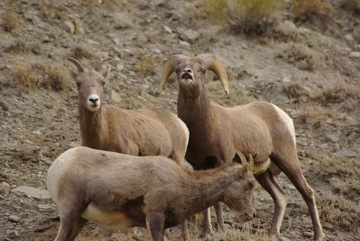 Misinformation Has Attributed to the Severe Declines in Some Bighorn Sheep Populations. An article also appeared from the Associated Press last night detailing the voluntary leave that Dr. Marie Bulgin has been placed under.